I’ve mentioned it time and again, one of the best things about blogging is the friendships and the connections with other bloggers. When one of us has something exciting happen, we all want to join in and shout it from the rooftops! Today, I want to shout out about a new cookbook by Michelle Stern, called The Whole Family Cookbook. Michelle is the founder of What’s Cooking, a certified green mobile cooking school for children. She teaches kids how to cook and teaches adults how to cook with kids…… all with a focus on healthy, practical food. I love her passion for getting families in the kitchen and cooking together! Recipes you can make with your family, for your family. Recipes kids enjoy making with their family and don’t mind eating. Steps color coded for recommended age groups. Perfect for parents who just learning to let kids into the kitchen. Numerous “green” tips, tips on eating healthy and local. Want to know more? Listen to what Michelle has to say about her book. When Michelle asked if I would like to try a recipe from her book, my eyes jumped right to the Frittata. We had made a Penne Frittata before and I was excited to try another, and what kid doesn’t love to crack 10 eggs! Michelle always has a plethora of eggs on hand, with the flock of chickens in her family’s backyard. Crack the eggs, one at a time, into a medium bowl. Check for stray shells. 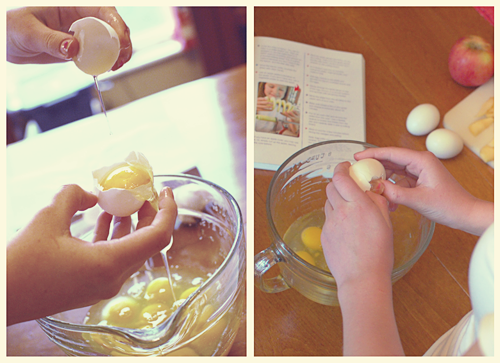 To separate the egg whites, crack the egg over an egg separator or someone’s clean hands. Carefully let the egg white slip through the fingers into the bowl, with the yolk remaining. Using a whisk, beat the eggs until the yolks and whites are thoroughly combined. Cook bacon. 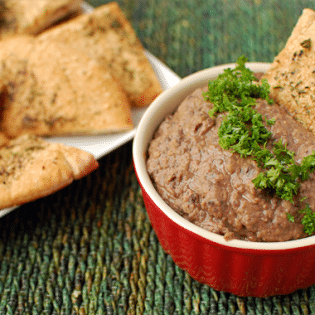 You can fry them in a skillet or bake them in a 425° oven on a cooling rack placed on a rimmed baking sheet. Let bacon cool, then crumble with clean hands and set aside. Grate the cheese. Younger children can help you use a rotary cheese grater . Older children can use a box grater. Add half of the grated cheese to the egg mixture and stir to combine. Add salt and pepper. Use a vegetable peeler to peel the apple. If you have an apple corer, you may use it. Or, simply cut up the apple, leaving the core behind. Slice the apple pieces very thinly. As you are cutting, be sure to put the flat side of the apple pieces down, so the chunks don’t wobble on your cutting board. 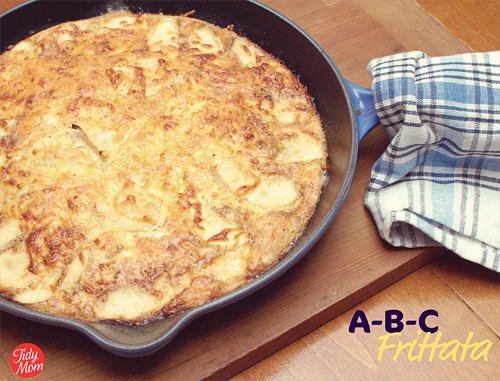 In a medium cast-iron or nonstick ovenproof skillet, heat the butter over medium heat. Add egg mixture to the skillet. Sprinkle the bacon crumbles evenly over the eggs. 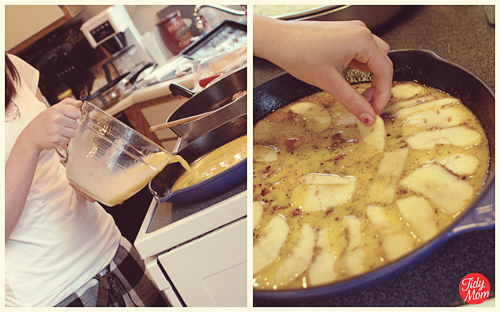 Gently arrange the apples on top of the egg mixture, in a circular pattern. Sprinkle with remaining cheese. Move the skillet from the stovetop to the upper rack of your oven. Bake until frittata is firm in the center and cheese is browned, about 20 minutes. Put on an oven mitt and remove skillet from oven. 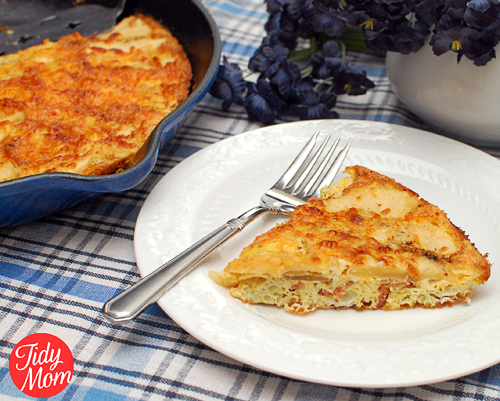 Use a flexible spatula to loosen the frittata from the pan. Carefully slide it onto a cutting board. Allow to cool for a few minutes before slicing into wedges. It was fun to watch the joy on my daughter’s face and her sense of accomplishment as we placed the Frittata on the family table. Now for the best part!! 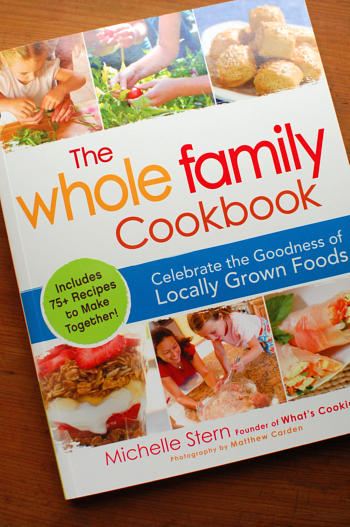 One lucky TidyMom reader will win a copy of The Whole Family Cookbook of their own! Disclaimer: I was given a copy of The Whole Family Cookbook for this review, I was not compensated in any other way. My favorite kitchen memory from growing up is the traditional sugar cake (cookie) baking at Christmas time. Decorating with the sugar was the best! My fav kitchen memories are those of me and my daughter cooking together! My favorite kitchen memory is of my mom baking and decorating my birthday cakes as I was growing up. I’d always help her by licking the beaters. Helping my grandma (my uber-Swedish grandma, ja) make Swedish pancakes in her kitchen. Served with Aunt Jemima Syrup (. . . not quite a Swedish topping, but whatever!). I loved those times as a kid. My favorite kitchen memory is helping my dad cut the marshmallows in half for the infamous cranberry salad! One of my favorite kitchen memories occurred just 2 weeks ago… our 12 and 17year old sons decided they wanted to make a Sunday brunch for the family, and proceeded to decide on the menu and come up with a shopping list. With a minimum of help from my husband and I, they cooked up a splendid brunch! I’m hoping this is the start of a “tradition”….. I grew up with my Grandma baking some of the most wonderful homemade bread, cookies and cakes. I can still taste her homemade bread with homemade jelly! Yummmmmm…now I make my own bread. Baking cookies with my mom. Favourite kitchen memory is the first time I baked with my little girl – everything got covered in flour and eggs, but the excitement on her face will stay with me forever. My very favorite kitchen memory is being so little I had to sit on the counter while I made cookies with my grandmother! A memory I will always treasure! Joined the cooking facebook community! I’ve been following you on facebook for awhile, but just subscribed through email! Love your blog!! My fave memory is with my kids….before baby #5 was born, the 4 boys and I took about 3 days to make up about a month’s worth of freezer meals for “after the baby’s born”. They chopped peppers and onions, they stirred pots, they played with the toddler, the bagged up food and laid foil over dishes! My favorite memory is of helping my mom and my sister prepare Thanksgiving dinners. The food always smelled so good, especially the pies! My favourite kitchen memory is of cooking freshly caught trout with my grandma in her kitchen (caught by my grandpa), then eating it for breakfast. My favorite kitchen memory is baking Christmas cookies with my mom and sisters – each of us baking a different kind of cookie all at once. Anytime I can spend in the kitchen with my son is AMAZING! favorite kitchen memory: when my teenage daughter started suggesting ways to improve upon some family-favorite recipes–and they WORKED! I am so proud of her! Thank you so much for sharing this wonderful book with us. I adore Michelle’s ethos, it reminds me so much of my aunt’s. When I was a little girl my mother was a single-parent with little to no cooking skills. I spent a great deal of time trailing around after my aunt in the kitchen. Learning how to whip cream properly, how to bake a cake, all the essentials. Even now there are some things I can’t bake without remembering the first time I was allowed to stir a bowl when my aunt taught me how to make it. Wow . . . my daughter so wants this cook book!! My favorite memories are with my daughters in the kitchen . . . my youngest loves to make french toast and my oldest just loves to cook period! 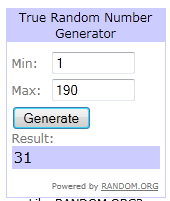 We hope to win this book so that we can make many more happy memories in our kitchen!! My favorite memories are from when my daughter was very small. I loved being at the stove, counter or sink, and looking over at her in her highchair or on her blanket or mat on the floor playing while I was cooking. Making cupcakes with my daughter!! She loves to help in the kitchen. Baking on Sunday growing up. It was usually choc. chip cookies or brownies but I looked forward to it all week. Watching my son make lasagna for ME!!! My daughter is only 5 but loves to watch Food Network. One way that I found to get her to cook with me is to pretend that we are hosting our own cooking show. She and I describe what we are doing as we bake/cook to our “audience.” It’s a hoot! Waking up on thanksgiving morning and walking into the kitchen, smelling all the wonderful food and sneaking some pieces of food! Helping any child in the kitchen is a lasting memory! The kids & I spend a lot of time in the kitchen, cooking or baking together. Every single time, is a memory I will always cherish with them. I am now happily following @WhatsCooking on Twitter! Loved spending time in the kitchen with my sister! Nice to teach others to cook!